Michael Flynn — who pleaded guilty Friday to a charge of lying to FBI investigators — contacted then-Russian ambassador Sergey Kislyak in December 2016 at the behest of a top Trump transition official and later discussed those conversations with other members of President Donald Trump’s transition team, according to prosecutors. As part of his plea deal, Flynn apparently admitted he was instructed by a senior member of the Trump transition team to contact the Kremlin and that he phoned transition team members at Mar-a-Lago on Dec. 29, 2016, to tell them about his talks with Kislyak. Prosecutors did not name the official who told Flynn to contact Kislyak nor the members of Trump’s transition team who were informed of the discussions. The admission adds another layer to the bombshell development in special counsel Robert Mueller’s investigation into possible collusion between Trump’s presidential campaign and the Kremlin and seemingly implicates other high-level Trump officials in the improper contacts — including, possibly, the president himself. According to ABC News, Flynn is prepared to testify that Trump directed him to make contact with Russia. The retired general was a major figure during the Trump campaign and briefly served as the president’s national security adviser before being ousted after it was revealed he lied to Vice President Mike Pence about his Russia contacts. Flynn has been under heavy scrutiny by Mueller for months. In recent weeks, he came under suspicion of cooperating with the investigation after his lawyers told Trump’s legal team they could “no longer discuss the special counsel’s investigation,” the New York Times reported. 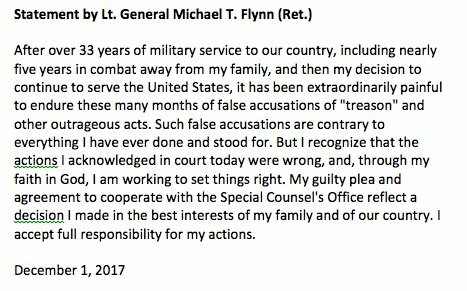 Flynn is the first official member of the Trump administration to be indicted in the Russia probe as the special counsel’s investigation edges closer to the president. “I accept full responsibility for my actions,” he said.